The afternoon of 16 July saw two talks on the stability of periodic travelling waves. The first talk by Olga Trichtchenko was on recent results on the implications of adding surface tension. This talk was based on the paper reported in the blog item here. The talk emphasized high frequency instabilities, and the numerical method, which was an integro-differential technique based on the AFM method. The second talk by Katie Oliveras looked at the implication of adding constant vorticity to the equations. 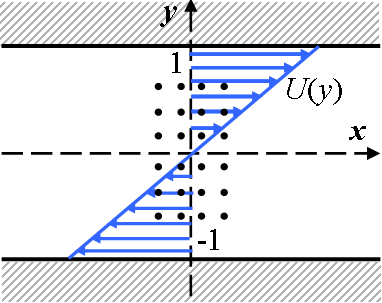 The basic state consisted of a velocity field (U(y),0) where U(y) is a linear function of y. A principal observation was that the vorticity could change the stability dramatically, even in deep water. The talk also discussed the relationship between stability of the travelling wave with respect to long-wave perturbations and the structure of the bifurcation curve for small amplitude solutions. In both talks, the perturbations were two-dimensional and subharmonic, with the perturbations parameterized by a Floquet-Bloch exponent. Videos of the two talks are here and here.